There are many ways to celebrate your Birthday, but my favorite is definitely having a stylish teaparty. You can drink tea, eat sandwiches and cake and....Oh forget the food, the best part is giving it a certain theme or dresscode. There´s nothing better than dressing up and wearing the perfect outfit for the occasion. There are so many different themes you could choose from; maybe formal if you like it classic, Alice in Wonderland if you love fancy dress or hats if you´re more of the British type ;) I decided to ask my friends to wear something eccentric - glitter, vintage, sparkles, fascinators, more is more! For the table, I mainly used Vintage decoration. I chose my Greatgrandmas 100 year old tablecloth and my Moms girly china. (Some of the china is mine though.) As for the cake; I chose a simple black and white one with Audrey Hepburn and cute, girly cupcakes. Es gibt tausend Wege seinen Geburtstag zu feiern, aber mein Lieblings Weg ist und bleibt wohl eine Teaparty. Man kann jede Menge Tee trinken, Kuchen essen, Sandwiches,.....Ach quatsch, die Hauptsache ist sowieso das Motto. Was gibt es besseres als sich hübsch anzuziehen?! Man kann aus jeder Menge Mottos auswählen: formal; wenn man es klassisch mag, Alice im Wunderland wenn man sich gerne verkleidet, oder Hüte wenn man mehr der britische Typ ist... ;) Persönlich hab ich mich dazu entschieden dass meine Freundinnen sich möglichst exzentrisch kleiden sollen - Glitzer, Glanz, Vintage, Fascinators, mehr ist eben einfach mehr! Für den Tisch habe ich nur Vintage Dekorationen verwenden. Das Tischtuch gehörte meiner Urgroßmutter und ist 100 Jahre alt und das mädchenhafte Geschirr gehört meiner Mami. Zugegeben, ein paar Dinge gehören auch mir... Bei meiner Torte habe ich mich eeetwas zurückgehalten: schwarz-weiß & Audrey Hepburn. Aber meine Cupcakes sind NATÜRLICH wieder niedlich pink! Lovely! I wish I could join you in the party! Those cakes are making me hungry now!!! Such cute photos! Your hair is amazing! You look awesome doll!! Beautiful photos! Your look is fantastic and the pictures are so cute! Wow, love this post. A teaparty! How fun! You look incredible. I am crazy for your pink hair. 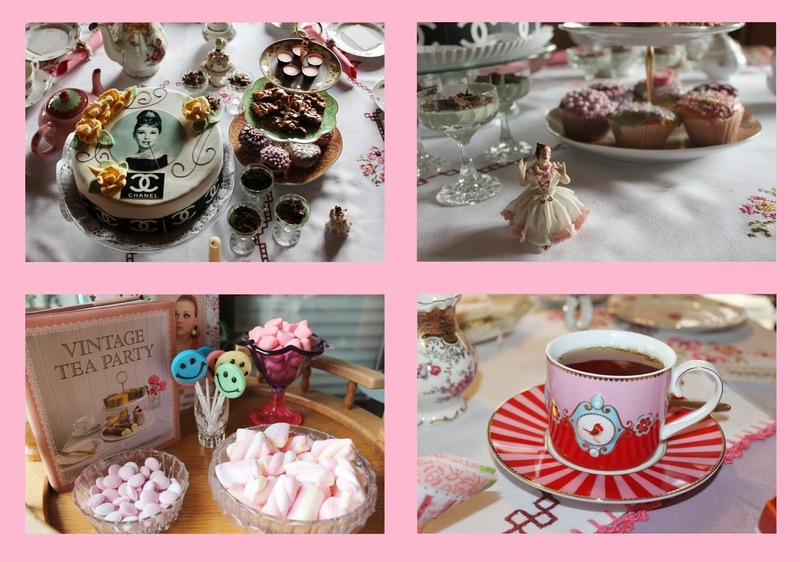 Im totally having a birthday tea party now, this looks fab! Your hair color is so damn electric, what dye do you use? What beautiful photos! Would you like to follow each other on GFC?! Let me know and follow me on my blog, I will follow you right back on both GFC and Bloglovin!